Now, some of you may be thinking, “Wait, that’s the first time I’ve heard about it!” It doesn’t really matter if this is the first time you have heard of it, or if you have actually read the floor rules before, let’s take the opportunity to take a more detailed look at some of the details of certain sections together! The first topic we will be looking at is “Aids (Tokens)”! Games such as Vanguard have been using them for a while now, so some of you may already be familiar with the subject. Aids (Tokens) is a visual marker which is often used to make it easier to understand what is going on during the game. Normally referred to as just “Tokens”, but in order to cover all bases, it will be written as “Aids (Tokens)” in the floor rules. In order to ensure smooth fights, fighters may use aids in order to assist them during the match. They are only used to denote values which are open information, change in values, targets, and so on in order to help visualize necessary information. They cannot be used for marking out specific card positions, indicating the number of cards, and other uses not stated above. Fighters using these aids must state clearly what the aids represent when using these items. Items that may be used as aids are flat beads (must not roll or move), dice, fighters’ counters, life counters, and so on. Stable 6-sided dice are highly recommended in order to avoid changing the values due to unintentional contact or vibrations. Multi-faceted dice with more than 6 sides or dice closer to a spherical shape are not recommended due to its unstable nature. For official tournaments, aids that meet any of the conditions stated below generally cannot be used. These are recommended for sanctioned tournaments as well, but the final decision will depend on the organizers and head judge. Any aids which have a mobile phone and/or smartphone functions, and communication is possible using these devices. Aids that are too big, and may cause obstructions, and/or affect the current game, as well as other ongoing games. Coins, paper notes(currency) and/or its equivalent. Other aids deemed by the organizers or head judge to be an obstruction to the said tournament, or basis for possible cheating. To be able to keep track of these changes at a glance…! To not forget these changes…! --items which help you achieve these points are known as “Aids (Tokens)”!! Just like the picture above, try placing the markers on top of the respective cards or close to it. When using electronic devices such as smartphones or portable game consoles to indicate life points, please take note to switch to flight mode and ensure that any form of communications is not possible with that device! However, aids (tokens) are ultimately items used to ensure that the game proceeds smoothly, so the fighter will have to ensure that it does not obstruct or hinder the game in any way! On top of that, do remember to remove any aids (token) from the table once it ceases to be relevant, and not leave it on the table causing confusion to the game! Of course, it is not a must to use aids (tokens) during the course of any game! As long as the fighters have clear communications as usual, they should be aware of the entire field and the changes involved, so it would be best to use the items when the situation becomes complicated! The next topic that we would like to cover is the very common “shuffle”! It is used without fail in almost all TCGs, so it would be most advisable to pay attention to this part! Well, let’s take a look at the revised part of the shuffle rules. Decks must be shuffled sufficiently to randomize the order of the cards. Fighters must show the process of shuffling to their opponent while keeping the deck within view, but without the front side of the card being visible in any way. In the event that there are only a few cards in a deck, or if there is a possibility that a fighter may be making an attempt to stack the cards, a fighter may ask a judge to do so instead. The judge may decide whether this appeal is legitimate or not. All shuffling and searching of cards from a deck should be done within an appropriate time. If a judge determines that the fighter is taking too long to perform the action, he or she may penalize the fighter. Methods of the shuffle are to be decided by the fighter shuffling. In order to achieve randomization, it is highly recommended to use a mix of different shuffling methods listed below. It is not required to use a mix of different shuffling methods for a confirmation cut or shuffle. A shuffling method where cards are dealt into various separate piles one card at a time, then consolidating all the piles back into a deck. The recommended method for the beginning of any rounds. As a suggestion, try splitting into 5 piles or 7 piles. If certain cards are grouped together before this shuffle, there may be a chance that this method may not serve the full purpose of a shuffle, so please do not use this method if the deck is in that state. If this shuffle is used during a fight, take extra care to do it fast so as not to be ruled as slow play. Splitting the deck into 2 piles, and combining them back into 1 pile again by force, weaving the cards into each other. This shuffle may be able to perform in an instant, but if the cards are held vertically during this shuffle method, front of the cards can be seen, so extra care and consideration must be taken to avoid this when performing this shuffle. On top of that, when pressing the cards together, do handle the cards with care. We would like to highlight 2 main points of a shuffle! （2） Only you can ensure that your deck is thoroughly shuffled! Not your opponent! The flow of the fight may vary with each card drawn, but that joy or sadness is the most interesting part of a card game. With regards to that, it may be natural to have those thoughts going through your mind while you shuffle your deck. But, take note that you cannot shuffle in a way to ensure that the above situations do actually occur. Drawing of cards involve a certain amount of chance, therefore making it a moment of sadness or joy. The main purpose of shuffling your own deck, and thoroughly randomize it. In other words, it is to ensure that shuffling results in a situation where “I can’t tell where each card is”. If the deck is in a state similar to above situations, then it cannot be considered totally randomized. In order to keep the fight fair, it is most important for all fighters to shuffle in a proper manner. Let’s take a look at 2 common cases of improper randomization. 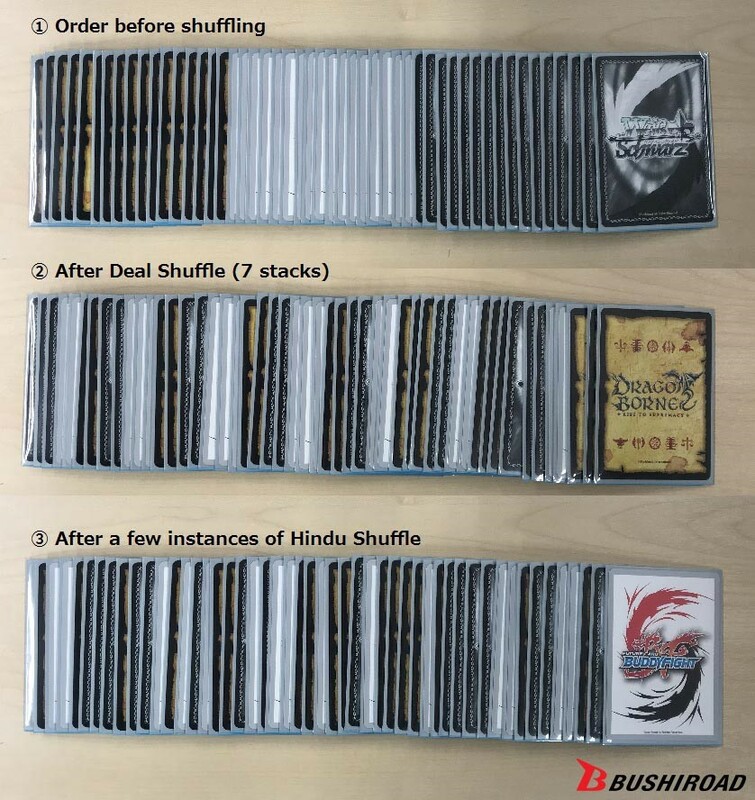 Deal shuffle (7 piles) 16 trigger units (Weiss Schwarz cards) which are stuck together, followed by a few instances of Hindu Shuffle, and they end up in the following manner. 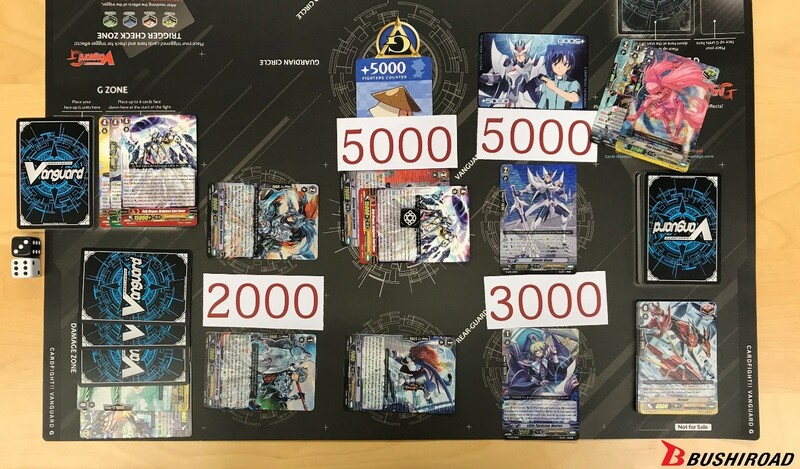 Trigger units appear continuously, Buddyfight and Dragoborne cards appear in twos and threes, so it seems that there is a notable pattern. In this example, using Deal Shuffle when cards are stacked together in the beginning does not yield a good randomization, and just takes up time during a tournament. For instances like these, try using another shuffling method before the Deal Shuffle in order to mix the cards up to a certain degree, and break up the possible patterns that may occur. Randomization will be increasingly difficult if the deck is in a certain order before shuffling. Do take care when shuffling before the start of a match! Next up, we have 8 climax cards (Buddyfight cards) slot into a deck evenly before shuffling. By performing only Hindu Shuffle a few times, the end result is as follows. After 2 sets of Hindu Shuffle, there is not much change in the order. This situation is entirely possible depending on the way a fighter cuts when performing a Hindu Shuffle. The Hindu Shuffle is repeated multiple times, but it is still far from an ideal randomization. 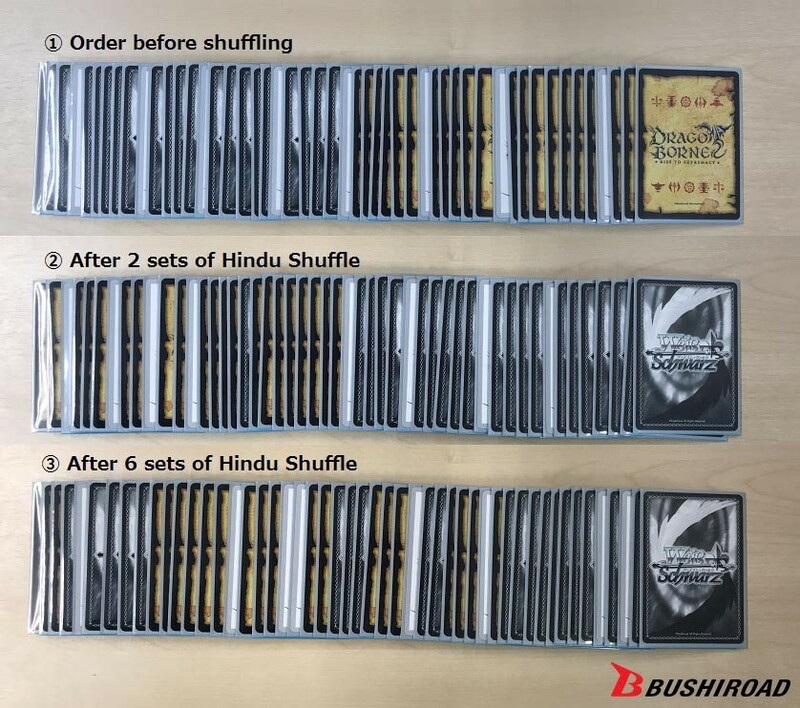 The main point here is that “the deck cannot be mixed up properly by using Hindu Shuffle alone”, and why it is recommended to use a mix of different shuffling methods to further improve on randomization. By using a combination of Deal Shuffle and Faro Shuffle, it is possible to improve on the point of randomization even further. Faro Shuffle is a convenient way of shuffling in a short period of time, but it is possible to damage the sleeves or even worse, the cards themselves if proper care is not taken. Furthermore, this method usually involves standing the cards upright at some point and may result in the front side of the cards being revealed. Do take extra care in performing this shuffle while keeping the cards horizontal as much as possible! Take special note that if there is no order in the cards of a deck before shuffling, it will be a lot easier to achieve randomization in a shorter period of time. Let’s try not to have cards in any order before shuffling the deck! Lately, it has been noted that these situations are occurring in various tournaments, and so the following regulations have been added in order to assist the judges. Just like the examples provided above, you cannot change the order of cards in an area or zone where such an action is prohibited, even if you shuffle the cards afterward. This regulation is to prevent any changes to the sequence of cards in a territory slated for shuffling before the actual shuffling occurs. Furthermore, in a state where the order of cards is known, it will be easier to consider it as stacking the cards in the fighter’s favor. It also helps the fighter avoid being accused of foul play, or any suspicions of cheating. On the other hand, if a lot of actions are prohibited, then the constricted environment would make the game and subsequent fights less fun. With regards to that, stricter penalties will be implemented for nationals and other tournaments with the right to advance to higher tournaments involved. While searching the deck for a card, it is noted that some climax cards are clustered together! “I want to separate them out…!”—and we can’t blame you for thinking that. But, that would result in tampering with the deck, so unnecessary rearrangements should be strictly avoided. Such cases may occur from time to time, and several cards are picked out. This situation does not violate this particular regulation directly, but since shuffling will take place directly after, so the sequence of the deck should not be changed, so let’s take note not to pull out several cards unnecessarily. In reality, having specific cards together makes it a lot easier to tabulate. However, it will take a lot more time and effort to randomize them later. With regards to that, this usually applies to TCGs where the deck can be refreshed, such as “Weiss Schwarz”. After shuffling your own deck, pass your deck over to your opponent, and as a form of confirmation, have your opponent cut or shuffle your deck. That is the general flow of shuffling. For those of you who have encountered similar situations, please stick around just a little longer! The deck your opponent passed to you has already been randomized! So, it is not necessary to spend too much time on complicated shuffling methods! In those cases, please perform additional shuffles. Now, why do we use a cut or a shuffle as a form of confirmation? It could be used to “prevent any forms of cheating,” but we would like to think of it as a form of “greeting”-- In other words, as a form of “communication” between fighters. This series of events, and the movement of cards is what truly defines an analog card game. It is the symbol of trust between fighters! ――We hope that everyone has enjoyed reading the article. Following this, there will be 2 more follow-up articles slated, so do keep a lookout for them! The wall of text may put off some of the fighters out there, but we will do our best to get the key points across in a simple manner. Thank you for reading, and have many great fights ahead of you! !